The leading Tour and Travel operators in Kenya and East Africa. As early as yesterday, we have received reports from our friends in the Maasai Mara that the long awaited Wildebeest Migration has finally started! This means that the annual dubbed world wonder is on for our viewing coming across from the Serengeti, in Tanzania! For some of us, we have probably heard of the great migration or watched of it in documentaries and wildlife movies, however the question remains.....what exactly happens in this migration that makes it so spectacular? 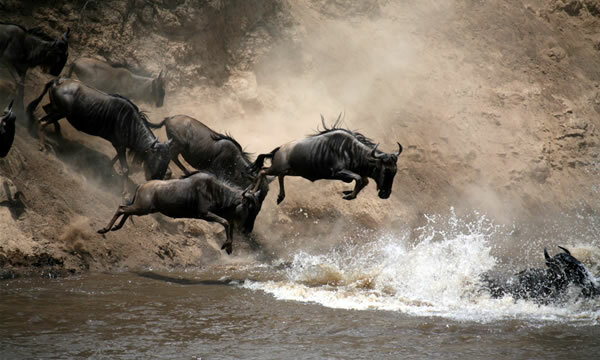 The wildebeest migration takes place over a wide area across Kenya’s Masai Mara and Tanzania’s Serengeti National Park. These parks are one continuous ecosystem divided by an invisible man-made border. Even though the migration is termed as the wildebeest migration in reality the move constitutes of approximately 2 million wildebeest and thousands of zebras and gazelles forming one super herd. Zebra are often found together with wildebeest as the zebra tend to feed on long tough grass stems preparing them for the broad muzzle of the wildebeest, more suited to close short grasses. The animals migrate to follow the rains in search of lush new grass, with the wildebeest spending the wet season on the plains in the south-east, and the dry season in the woodlands of the north-west. The 800 km pilgrimage is an ongoing cycle of movement and dispersal that is not continually in forward motion. The wildebeest need to drink daily and their movement is very much dominated by the accessibility of water and they seem to have a sixth sense in following the storms. This epic journey has no real beginning or end. The life of a wildebeest is an endless pilgrimage, a constant search for food and water and it doesn’t come without its perils, each year over 250,000 wildebeest will die as a result of injury, exhaustion or predation. 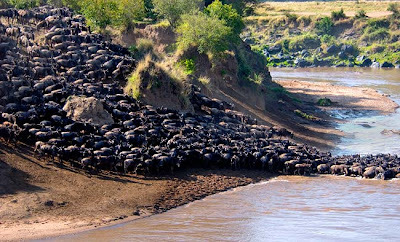 The river crossing at the Grumeti and Mara Rivers has been well documented by film makers and photographers, who have captured the “no other choice” suicidal plunge where the wildebeest are forced to plunge into the crocodile infested waters often drowning in thousands! It is an unusual safari, that has left millions in awe trying to understand it, but until today remains one of the world wonders of nature and wildlife! For where to stay in the Masai Mara click here. Skiing in 2013 - Another Great Plan! The leading Safari and Travel Agent offering exiting safaris and holidays in Kenya,East Africa and to the rest of the world. Copyright ULGT 2011. Simple theme. Powered by Blogger.